Strawberry Banana Overnight Oats is the perfect grab-and-go breakfast for your busy mornings. This healthy mixture tastes more like a decadent dessert than a healthy breakfast. Last week I traded my traditional warm bowl of oatmeal and hot coffee for jazzed-up overnight oats and cold-brewed coffee. What’s the old saying… Out with the old and in with the new? I’m more than ready for fresh produce, seasonal salads, and a plethora of sweet fruit. Strawberries are usually the first seasonal fruit to hit the shelves in my local grocery store and farmers’ market. Bright red, sweet, and juicy. I have been craving fresh fruit all winter. Sure, frozen fruit is readily available year round, but nothing beats the flavor of fruit at its peak. Every spring I push my bowls to the back of the cabinet and reach for my mason jars in preparation for a season of overnight oats. I’m extremely predictable in the morning. I wake up and head straight for my coffee counter where I begin preparing a very large mug of coffee. You read that right–I have a small portion of countertop dedicated to a variety of coffee paraphernalia. I ditched the coffee maker last year and switched to French-pressed and pour-over coffee in the winter and cold-brewed coffee in the summer. Ditching the coffee maker was the best decision ever. My French press and Chemex make a far more superior cup of coffee. After my coffee is ready, I turn on my computer and grab a jar of overnight oats from the fridge and begin working. I very seldom stray from the routine. This healthy breakfast option tastes more like a rich dessert than a healthy jar of creamy oats. As soon as I shoveled the first spoonful into my mouth, my thoughts went straight to cake. I remember thinking, “Oh. My. Word. 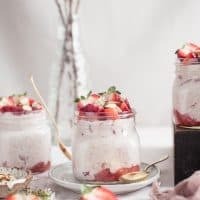 This jar of oats tastes like cake.” Now my fridge is stocked to the brim with mason jars full of strawberry banana overnight oats. It’s a glorious thing. I truly believe that it’s the vanilla almond milk that attributes to the cake-like flavor of this recipe. I’ve made it with regular almond milk and cow’s milk and it didn’t taste the same. Also, the strawberry banana Greek yogurt is key. I wouldn’t skip it. A creamy mixture packed full of protein, fiber, and nutritious fruit. This grab-and-go breakfast will be a weekly staple in your refrigerator. In a small bowl, combine oats, yogurt, almond milk, and honey. Stir to combine. Fold in sliced strawberries and bananas. Transfer the mixture to an airtight container or mason jar. Top with toasted almonds. Allow the mixture to chill in the refriferator overnight. If you can’t find strawberry-banana Greek yogurt, you can substitute plain, strawberry, or banana Greek yogurt. If you use plain Greek yogurt, you may need to add extra honey. Any type of milk will work in this recipe. I prefer the vanilla almond milk and beleive it tastes the best in this recipe. You can add or decrease the amount of honey you use depending on your preference. If you don’t like honey, you can substitute maple syrup. I typically stick with traditionally cooked oats even in warm weather, but this looks and sounds so good, that I can’t wait to give it a try. I am ALWAYS looking for new breakfast recipes as it’s by far my favourite meal of the whole day. These overnight oats look absolutely divine! I’ve made quite a few overnight oat variations, but never strawberry and banana – need to make these!! yes, yes, YES! SO ready for warmer weather and new bright foods, for sure! Overnight oats are so nice, right? really any time of year, too, b/c of the limitless flavor combos you can do. I love this one – strawberry banana is a go-to for me in the flavor department since i was a kid. OhEmGee! Love the new look and the new name, Jennie. It’s still very fitting with your messiness! ;) I’ve been thinking of rebranding myself and came up with some fab name ideas… all of which are taken! Boo. This looks great! I am always looking for new ways to eat oats, and for ways to sleep in longer in the morning :) how long do these keep in the fridge? Wondering if I could make a bunch Sunday and have them throughout the week or if they’d get funky before Friday hits.